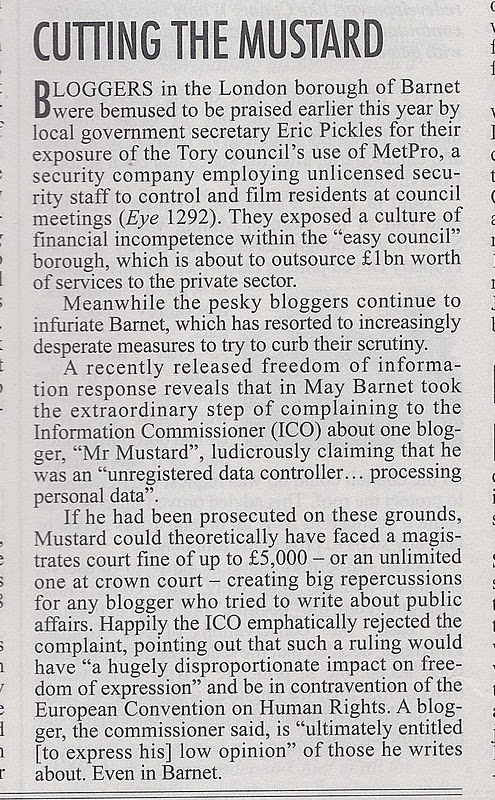 Mr Mustard ( mrmustard@zoho.com ): Buy Private Eye ! Ooh Mr Mustard is ordering us about; he doesn't normally do that. What reason can there be? Well it is because today he is in Private Eye issue 1302. So that is a good reason to buy the magazine today. What good reason is there to buy the magazine on any other day? Well, for a start, it is a bargain £1.50 and there is so much material in the magazine that it will keep you amused until the next issue comes around. The front page cartoons are legendary. The whole magazine is hilarious (except when it is being serious - not very often) it will shorten your commute. You will be better informed about what goes on in the country. Why not ask your partner to get you a subscription for Christmas. Only £28 - there will be enough money left over for some socks as well. and it is very well written, I thought, Mr Mustard, didn't you? "Learn from their success and mistakes"
Who ate all the pies? ( but isn't overweight ). Putting Barnet's Businesses First - or last ? Form an orderly queue now ! GFC - 3 Nov 2011 - 8pm - Redundancy is fun.